A new mosque, Juma Masjid, built by Dr. Thumbay Moideen – Founder President of Thumbay Group and his family at Al Maqdisi Street in Sharqan area, Sharjah, has opened its doors to worshippers from today, 13th August 2018. Located opposite to Anjad Police Station, the mosque serves all five daily prayer times, Friday and Ramadan prayers, and is conveniently accessible from Street 59. It has the capacity to accommodate 200 worshippers, and has separate entrances and prayer halls for men and women. An important highlight of the masjid is that its Friday sermon (khuthba) is delivered in English. 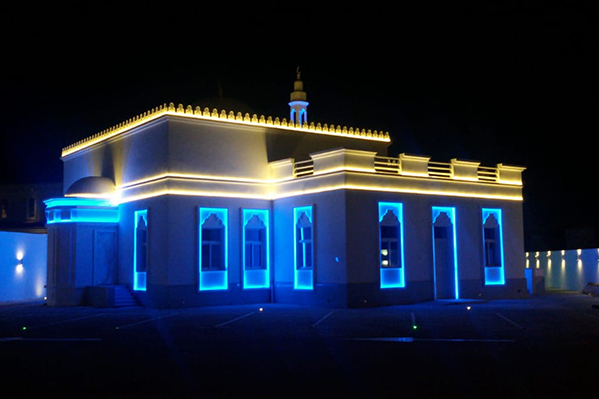 This is the second masjid built by Dr. Thumbay Moideen and family in the UAE. The first one – Thumbay Moideen Masjid – located at Thumbay Medicity in Al Jurf, Ajman has the capacity to accommodate up to 400 worshippers at a time, has separate entrances for men and women and has English khuthba.